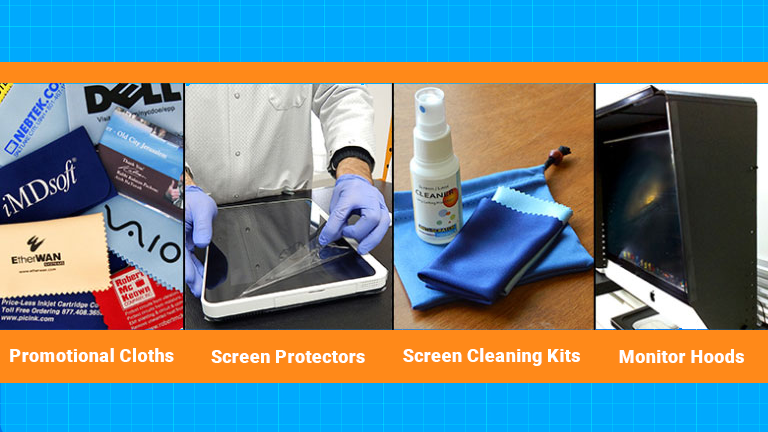 What sets Photodon apart from our competitors when it comes to screen protectors, privacy filters, monitor hoods, promotional microfiber kits and screen cleaning supplies? We're a small, custom shop, with a focus on lightening-fast, friendly customer service, and high-quality products. AND our prices are fantastic for our way-above-average long-lasting products. Our motivation? Knowing that we're helping people solve problems such as protecting expensive electronic equipment screens from getting scratched or broken, or knowing that we're providing blue light film that will safeguard our customers' eyes from the harmful effects of blue light spectrum on the human eye. Our high-quality adjustable monitor hoods help our customers in schools, libraries, and open office spaces, where an individual may need protection from glare on their computer screen, or they may need privacy in a testing situation. Photodon's custom- made adjustable monitor hoods have a fiberboard base, exterior vinyl, and a light absorbing gray cloth interior. Our hoods can also include a calibration door or can be made in a slim (6" width) design. 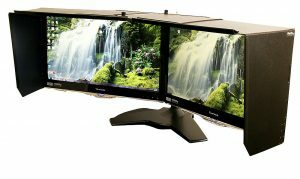 Our dual monitor hoods can be adjusted to an angle of 40 degrees so that side-by-side monitors can be positioned for comfort and privacy. A dual monitor hood provides a creative solution to those in open office environments by giving users some degree of privacy. 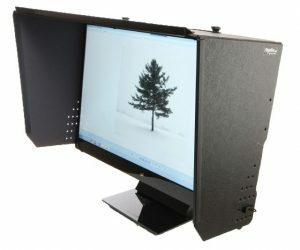 A Photodon monitor hood will last for years because it's constructed with durable materials. Discounts are available for bulk orders. In addition, we offer a wide variety of microfiber cloths — from premium grade promotional cloths to everyday cleaning cloths. We pride ourselves on very competitive pricing, quick turn-around time, and personalized customer service. If you need a quote for our promotional microfiber cloths, we'll be happy to provide one. Our cloths can be combined with a kit which might include an assemblage of any of our products: screen cleaners, screen protectors, and pocket-sized sprayers and travel bags. We'll label any of our products with your company's part number or barcode if needed so that keeping track of your inventory is a cinch. Lastly, all of our cleaning solutions are top grade and fairly priced. Our Photodon Ultra is eco-friendly, hypoallergenic and odorless — with excellent customer ratings. Another hot product Photodon carries: You can minimize static electric shocks in an industrial environment by using Staticide Anti-Static Spray from the Photodon website. Owners of gyms, where rubber mats are used, tell us that when spraying down their mats regularly with Staticide, static electricity is eliminated. Whatever your business needs are, Photodon is standing at the ready to join hands and work together. This entry was posted in About Us and tagged Anti-Glare, Cleaners, Clear, Microfiber Cloths, Monitor Hoods, Protective Film, Screen Protectors, Staticide Anti-Stat Spray.